Outdoor Hour Challenge #45 is Squirrels. We have plenty of them, three at least, all Eastern Gray Squirrels (Sciurus carolinensis). They come out when the sun is bright on the snow. I’ve reported on our resident squirrels before, when we did an experiment leaving an apple outside and when the squirrel got hold of our Indian corn. 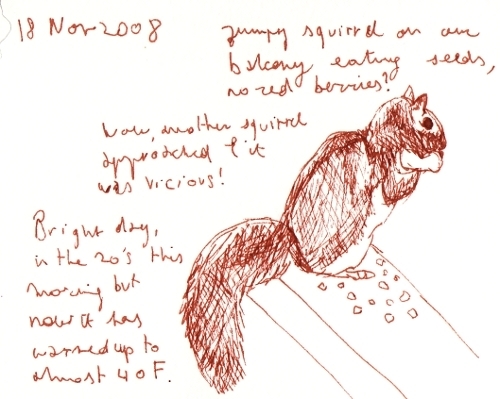 On that last occasion the gorging squirrel sat still long enough for me to drawn it from life. We’ve had many occasions since then to observe “our” squirrels. I often save scraps of food out of the compost bucket and leave them on the balcony ledge, right in front of our window. Oftentimes I just know that they are studying us as much as we are studying them! We’ve gone out and investigated squirrel tracks. 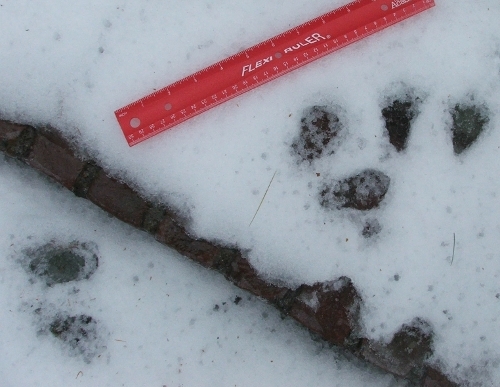 They are vague because old and because the snow had melted a bit, but these are definitely (two sets) of squirrel tracks. But his morning was surely a high in our squirrely studies. Amie yelled: “Mama! 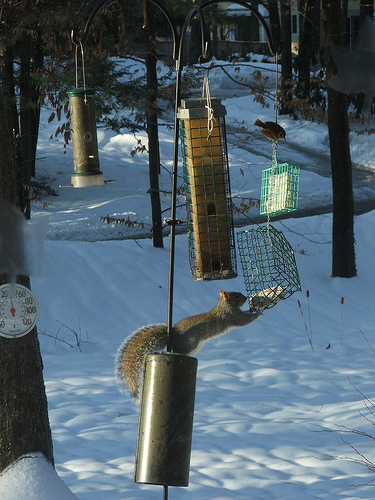 The squirrel is eating the birds’ food! Shoo! Go away, squirrel!”. You see, yesterday we had a short thaw followed by a hard freeze, so the snow in our garden, two feet high, is now capped with a hard shell from which the squirrels can jump onto the top of the baffle. I call this picture “Unbaffled” (the baffle is that black cylinder: it’s supposed to stop the critters from climbing up via the pole). 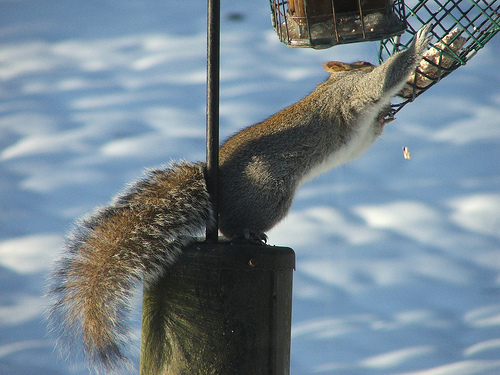 From the baffle, the squirrel lunged for the hanging suet basket. It was a sight! We witnessed a lot of acrobatics, and a lot of suet being consumed. As you can see the intrepid Carolina Wren wasn’t afraid at all, and ate from the same block of suet the squirrel was grasping. The other birds hung back. I let them eat some, then threw out some cut up apple cores, then shoveled the snow around the feeder. Party’s over. Amie wanted to put out one of the “experiment pine cones” for them, but I explained they only eat the seeds inside the cones, not the cones themselves – which led to some discussion of what a cone is made from and what its function is. After preschool Amie and I went into our yard to look for squirrel nests. 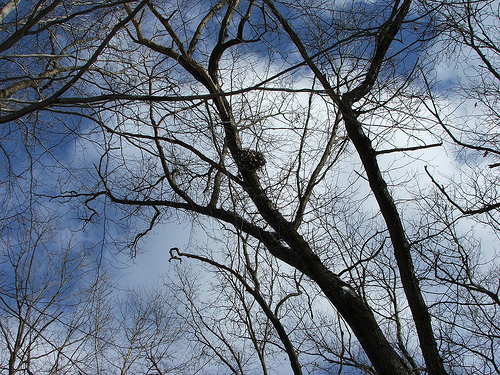 She was surprised that our squirrels (Gray Squirrels) live in trees in nests much like birds, only bigger and not so well constructed. 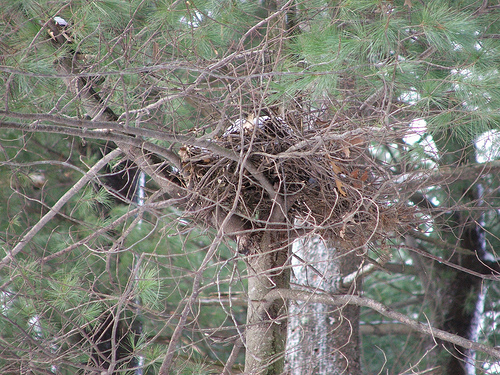 We also found out that a squirrel is not attached to any one home, and often has half a dozen where he can bed down. 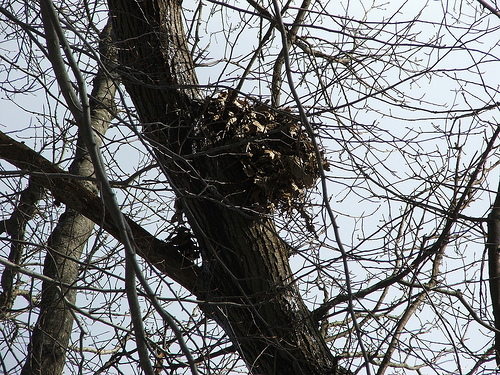 We found three nests that we suspects are squirrel’s nest (click for larger). We found a dead squirrel many months ago. It had been attacked by a fox, maybe a cat or smaller dog (though I doubt that), who had taken a chunk out of its thigh. I dropped it over the fence so the meal could be finished, but now I wish I had buried it somewhere. I could have dug it up and cleaned and mounted the bones… I remember once, as a child, after we had rabbit stew, we put the skull in formaldehyde (?) and kept it. It would be neat for Amie to do too. Maybe when we’re a bit older. UPDATE on the Squirrel Shenanigans here. This is a fantastic squirrel study! You have very entertaining subjects at hand, that is for sure. I think squirrels are very clever and your photos really show that. 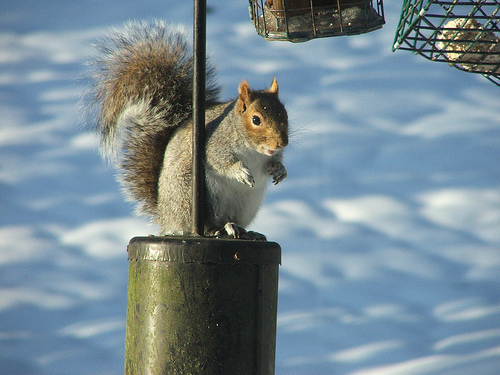 I would love to use one of your photos for next week’s photo of the week…probably the squirrel on the baffle eating the suet with the bird watching….priceless. 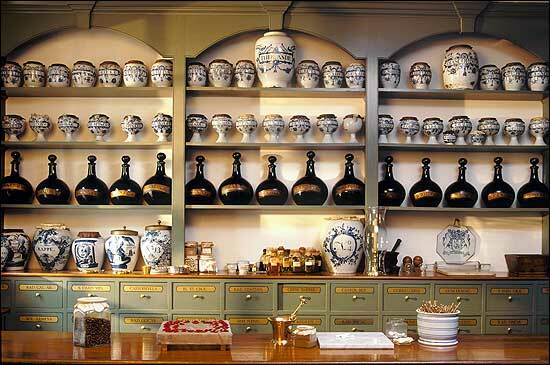 I loved the squirrel’s nest photos as well. I have yet to see any myself. We have California Gray Squirrels here and they look very similar to your gray squirrel. I will have to do some research.